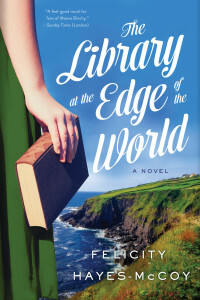 Felicity Hayes-McCoy’s The Library at the Edge of the World is a feast of the senses for the middle aged female reader. Bonus points if: you love comfortably safe prose, you can juggle an abundance of characters with artificial quirks, and can forgive chapter-opening sentences including, “As the day of the councilors’ vote approached, the pressure was really on.” This is Ireland native Hayes-McCoy’s first novel, having established a career in theater, radio and TV; Library at the Edge is her personal manifesto on the enchanting rurality of a small but bustling community along the crashing waves of the Irish coast. As a reader, the enjoyment available is directly proportionate to the amount of demographic data you share with Hayes-McCoy. Readers outside this target market will find an overly crowded, tone-deaf carnival of navel-gazing. 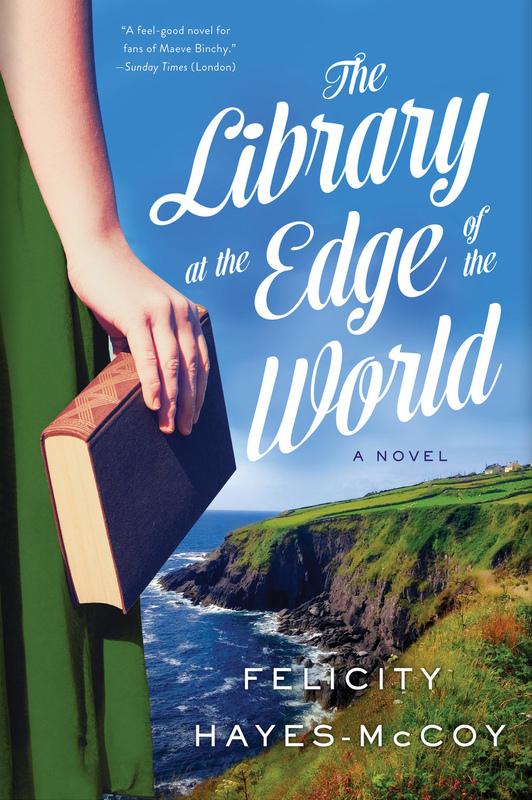 Fiftysomething Hanna Casey is a librarian on Ireland’s fictional Finfarran peninsula, where she drives along the coast in a mobile library to extend literature’s reach to isolated communities. In her recent divorce, she pridefully refused to accept a penny from her philandering husband, but in the opening chapter comes to regret this (heavily). Otherwise forced to reside with her imposing mother, she endeavors to renovate a coastal shack inherited from her grandmother, so as to carve herself an independent space. Funded by a loan, she hires a contractor with an abrasive personality and unconventional construction methods—and boy, do sparks fly. Meanwhile, the peninsula’s budget is under threat of drastic restructuring, including a proposal to close the library and tourist bureau and replace it with an app for tourists to use on self-guided tours. With the identity of the serene yet spirited community thrust onto the chopping block, can a wide array of personalities band together to fight the tides of change and protect the status quo they so cherish? Folks, you bet they will. Time out, everyone. A leap of faith, a perilous investment of love and creativity? No, Hanna is just paying someone else to renovate a cliffside shack. Backed by money she doesn’t have, since a loan’s required to fund the endeavor. Even paying it back is not looking good, with the district’s budget rearrangement poised to cut funding for her library of employment. Hanna might as well be one of the millennials who take Instagram photos of themselves in Jiffy Lube waiting rooms with the caption “Getting my oil changed. #Adulting.” No, adulting is when you lie down under the car, get your hands greasy and do it yourself. For Hayes-McCoy to present this endeavor as any kind of brave journey is an embarrassment. Meanwhile, Hanna’s daughter Jazz is fully employed, houses and feeds herself, and derives sufficient fulfillment from her lifestyle as a flight attendant. She could teach her mother a thing or two about personal responsibility, but unfortunately the topic never comes up. Jazz’s relationship with her divorced parents, one of the very few interesting threads in this novel, is unfortunately kept at the margins. It operates silently in the background until the final few chapters, at which point the only way to tie it up is with an abrupt “deus ex disaster” that reunites the major players for a final reckoning. Yuck. There’s a specific characterization device Hayes-McCoy leans on that begs to be identified and indicted. Connor, one of the employees at Hanna’s library, uses a Vespa scooter as his primary mode of transportation. He drives his Vespa. He parks his Vespa. He shows up on the Vespa, he departs (on his Vespa). “His Vespa” is needlessly mentioned so many times that no drinking game could compensate for the irritating frequency with which it’s referenced. It’s a cheap, lazy attempt to make a character unique or memorable, and incredibly, it’s not the only example. Fury, the curmudgeon contracted to renovate Hanna’s shack, is usually accompanied by his dog, the Divil. The Divil barks, the Divil jumps hither and thither, and most of all, the Divil contributes nothing to the story or thematic development. Each mention of the Vespa and the Devil is always capitalized, and each mention of the Vespa and the Divil is always unnecessary. The Library at the Edge of the World contains far too many minor plot threads. Some of the peripheral characters eventually get chapters from their own perspective, but they trigger too big a momentum break to feel relevant, resulting in chapters that feel shoehorned in because there was no where else to put them. It’s fair to expect that if a novel chronicles a community’s attempt to band together to preserve the cultural zeitgeist they cherish, logically it should include a wide variety of characters. But this novel just stumbles through every opportunity to make relevant the inner workings of this scenic, fictional peninsula in Ireland. Hayes-McCoy also utilizes an odd style of dialogue in which characters’ verbal statements are sometimes presented in quotation marks but are at other times (without warning) slipped into larger non-quotation paragraphs. It’s an arbitrary style choice that perfectly accentuates the best way to describe this book: a self-important mess.